Property disputes can be resolved in ways other than going to court. If you discover that your neighbor's fence is on your property, try to find out how the mistake was made, and don't automatically assume that the fence was installed out of spite or without consideration to your property. You have the right to obtain documents that will pinpoint the boundary in question without leaving the final action up to a court judge. At the same time, you should not avoid the issue for fear of harming your relationship with your neighbor. Removing a neighbor's fence from your property involves a lot more than just physically taking the fence down. Review whatever existing documents you have on your home/land that defines your property's boundaries. You may not have the deed or title to the property if you still have a mortgage on it. If that's the case, obtain deeds and titles at your local county clerk's or recorder's office. You can pay an abstract company to retrieve that document for you quickly if you don't have time to do the research yourself. Approach your neighbor about his fence being on your property. Provide copies of the paperwork on the parcel or parcels of land in question. At that point there may be several options to discuss, including sharing the cost or moving the fence or working together to physically do the job yourselves. 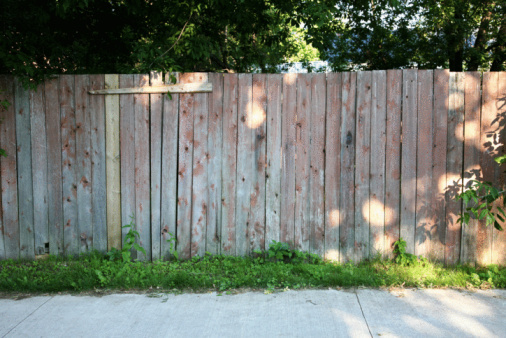 According to FindLaw, maintenance and/or replacement costs of a fence can be the responsibility of two neighboring property owners if both of them use the fence. Contact a licensed land surveyor. A land surveyer's services will be needed if the property line is still disputed and an interpretation of old deeds is needed. If your neighbor agrees to move the fence or take it down, a surveyor may still be needed to make sure the property boundaries are clear. Talk to the town or city code enforcement office. There may be specific ordinances for moving or replacing fences, including dimensions of the fences, required building permits and fees, or deed restrictions on the property that might not be noted in the other documents you reviewed. For example, new chain link fences might not be allowed in a community, but it's possible that your neighbor's was grandfathered in because it was installed before the local code was written.